WhatsApp is the most popular Instant Messaging (IM) platform of this century. While the likes of Yahoo Messenger, Hangouts, Skype rocked during the less smartphone filled days. WhatsApp is ranked as one of the most downloaded apps of all time, this not only makes it a superior version of Viber, IMO and Wechat combined but rather a must have app for every smartphone user. At a time when WhatsApp was rumored to merge with Facebook and Instagram before news came out of a cryptocurrency to ease payments on the platforms. It’s when the messaging app now features a new dark mode feature for Android ssers after an early rollout to IOS. 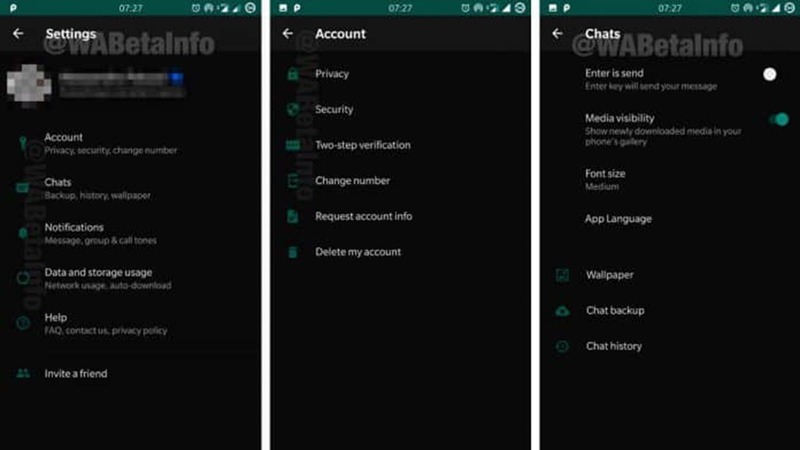 WhatsApp dark mode is currently available for Beta Users on Android with version 2.19.82 leaked by WABetaInfo. Just like the iPhone layout, WhatsApp conversations displayed in dark mode have a black background, message balloons in gray and dark green, gray keyboard, white letters, and blue details. However, it’s only the settings option and its inline options that so far have the new WhatsApp dark mode and we expect to see conversation chats spiced with a dark background in the next update. Either way, a couple of IOS WhatsApp features are slowly making their way to Android as Dark mode is just a slice of them all. So as we eagerly wait for the next official update and a pile of dark mode accompanied tweaks. The new feature purely reflects that the messaging giant is slowly cruising to what the leading mod GBWhatsApp offers to users including more effective options where a user can fully customize the app to the best design and color. Henceforth as WhatsApp ships in the long-awaited dark mode that will now allow you to choose between the basic White background and the Twitter night like mode on Android. It’s no doubt that the messaging platform will be just another exciting must have Smartphone companion at a time when feature phones like the MTN Kamunye come pre-installed with the app.